Phoenix East Aviation (PEA) is proud to announce an expedited cost effective way to get your European Aviation Safety Agency (EASA) pilots license in parallel with your FAA license! Don’t wait two years and earn only limited hours towards an EASA commercial license when, PEA can offer you the opportunity, after gaining your FAA license, to become a paid flight instructor, earning all the hours you will need, while doing EASA training at the same time. Please contact our admissions office to learn, in conjunction with our partner schools, how PEA can train you towards an EASA license as well as your FAA qualifications. Barcelona Flight School strives to provide our students at PEA with the best quality training possible, since this will make the difference between success and failure later on their career. Airlines always look for the best trained applicants, and will test and value their actual knowledge and flight standards before committing to a new hire. 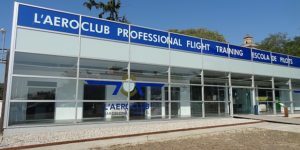 Our training programs are certified under European Aviation Safety Agency (EASA) Part FCL Regulations, and are designed to help our student pilots to achieve the required Learning Objectives and Flight Experience in the minimum timespan needed, while maximizing their employment opportunities with the airlines. Barcelona Flight School is certified by the Spanish EASA representative, the Agencia Estatal de Seguridad Aérea (AESA), as an Aviation Training Organization (ATO) with the number EATO037. If you are interested in attending Barcelona Flight School to obtain your EASA pilots license while you are attending school at PEA please contact our admissions office today! 1. Train In The U.S.